Click on image to open as PDF. 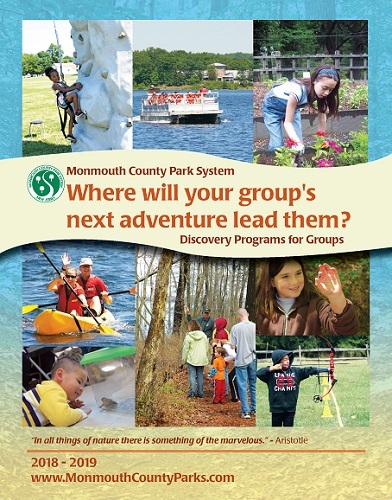 The Monmouth County Park System is proud to offer many opportunities for school, community, scout, and other groups. Our group programming creates opportunities to develop leadership skills, participate in team building and enhance critical thinking. Our environmental education and outdoor adventure programs provide hands-on experiences that include recreational activities and exploring the exciting natural and historical aspects of Monmouth County. Many of these programs are offered as traditional field trips with locations available throughout the county parks, and some can travel to your site. Many programs are available year round, others only during specific months at certain facilities. Please allow at least four weeks prior to scheduling your group activity. We suggest scheduling programs 4 to 6 months in advance and will accept reservations up to one year prior to the program date.